The last remaining survivor sold her suit case collection on a Wiltshire auction held by Henry Aldridge and Sons. Reffering to BBC the collection fetched ofer Ã‚Â£30,000 and included prints and letters. 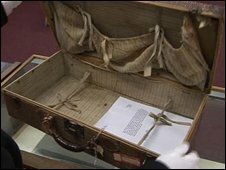 "The Titanic International Society had bid for the items with the intention of giving them back to Millvina. Unfortunately they were blown out of the water by other bidders." I would've bought that. looks cool.